Kershaw-Knives.net is ready to answer your questions and address any concerns. If you have a question that you think others may benefit from, please ask it in the comment section below. If you have a question that is more confidential in nature then use the contact information below. I’m trying to order two of the knives you have on sale for $29.99 each, but when I go to pay via PayPal the price increases to $39.99 each. Please advise. Found the problem and fixed it on the same day. I also sent you an email to make sure this is all taken care of. One of the screws that hold the pocket clip has has broken on my Kershaw..I had this one engraved w/ my sons name, so it is pretty special to me ..This is an 1830 model . Thank you for writing. 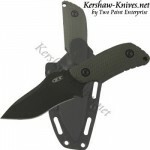 Kershaw knives are under a lifetime warranty, and the manufacturer will replace that screw for you. Give us a call at 800-458-1606 if you can’t get in touch with the manufacturer, and we’ll be glad to help you. I am looking for a knife to take to my relative in Canada who owns a diving company. His divers have to do a lot of cutting ropes and nets off of ship propellers. What knife(s) do you recommend for this kind of job? I was going to order him a 1077 model but I am not so sure. Think he needs something with a serrated blade. Please advise. Thank you for your interest. The model 1077 might be a little big for that depending on how big the propeller is. I also imagine they would need something serrated so they can rip through it quick. They also need something on the large size size the cutting probably needs to be done fast and crudely, instead of intricately. I dropped my knife and it landed right on the tip and a little piece broke off. I have the leek design model number 1660BLKW Ken Onion design. I love the knife but I need to fix the end. What are my options? I been carrying a knife all my life and it doesn’t feel right without a tip. Help. I’m sorry for the late reply. We are just noticing this in our wordpress blog. Please give us a call at (800) 458-1606. Also I will send you an email.